Last night, Argo won the Oscar for Best Picture. There was a lot of competition in a strong year for cinema, so many people had wildly divergent guesses as to which film would win, and many threw up their hands saying it was impossible to predict. But Argo‘s victory was predicted, nearly five years ago, in the surprisingly good Tropic Thunder. Surprising, because it starred both Ben Stiller AND Jack Black. On February 15, 2013, a meteorite slammed through the atmosphere and nearly destroyed a good portion of Russia. An asteroid much larger than that passed close to Earth the next day. 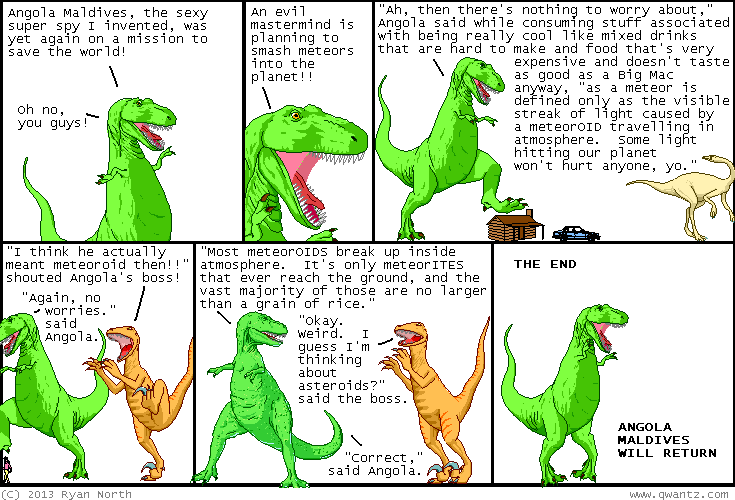 In case you’re unfamiliar, here are the differences between the most frequently used terms for large hunks of rock hurtling through space, as explained by the talking dinosaur pals of Dinosaur Comics.